The Truvativ Firex is an all-mountain chainset - forged out of AL-66 alloy material for a lightweight durable and beautiful design - Giga X Pipe (GXP) External Bearing System - supplied. 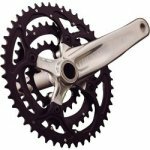 With AL 7075 chainrings - cold forged and CNC-d - 9 speed - 44-32-22T. Weight 940g. (Bottom bracket included). Colour: 68/73 Blast Black. Shifting: Smooth, ramped & pinned shifting. Chainrings: AL 7075 chainrings, cold formed & CNC'd. Options:Triple 44-32-22/48-36.